Harvey Updyke has a new least favorite car company. 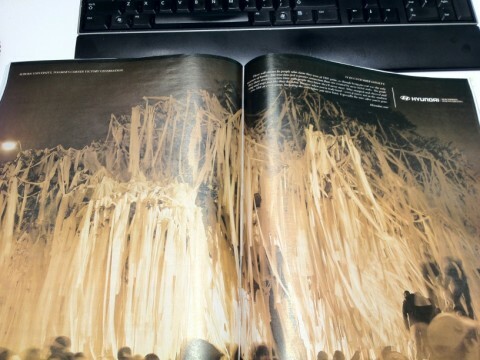 A picture of Toomer’s Corner shot during what looks to be the celebration after Auburn won the national championship is featured in a Hyundai.com advertisement in the latest issue of ESPN The Magazine. The two-page, full-color ad is part of the car company’s new “Loyalty” campaign tied to its sponsorships of athletic programs at Auburn and 15 other universities. There will always be people who claim they were at THE game, as though being present was the only measure of loyalty. But true fans feel a greater connection than one created by mere ticket stubs. The pride they share stretches across time with people they know they’ll never met. Who stomped and cheered and sang and wept just like they do today. Because when you’re truly loyal—even if you’re not in the stadium—you ARE at every game. Including the ones before you were born. Especially the ones after you’re gone. According to a spokesman for Hyundai of Auburn, a Hyundai tent and car display will be set up on Auburn’s campus for Saturday’s game against Ole Miss. h/t @AtlantaAUClub, photo via Stephen Pickens. Related: Nissan’s Bo Jackson Heisman ad. i hope the typos are in the reproduction above, and not in the actual copy. not picking nits, just a couple of glaring errors that interrupt the reading. Oh, man… I’m cracking up. Worst editing ever — on my part, not Hyundai’s. Fixed. Wor Eegl. I know the girl who took the picture and she is an AU alum ’09… i think she is new to photography. She did a great job! Choking up. I hated that I couldn’t afford to go to Glendale but at least I was at the Corner. It captured that. Very nice copy-writing, Hyundai.